These two cards of James are great examples of good design. They make an otherwise unexciting, in warm-ups and without pads photo shot of James look almost appealing. It certainly was enough for me to want to get them autographed. 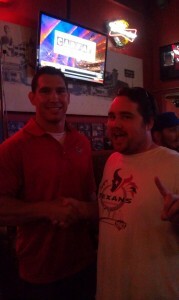 I met James at the Texans Draft Party in 2011 along with Danieal Manning. When James autographed them he remarked that I must be a professional because I knew to put talcum powder on the card to dull the sheen on the card. I then told him that I was a big fan, and through Dave, had gotten a lot of autographs from the team in the past on cards I still had. Casey then took an otherwise awkward looking photo with me, and stuck to the book with his interaction. 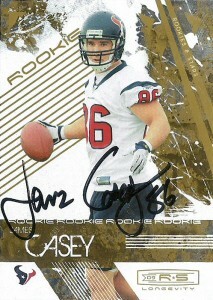 Casey’s autograph in my humble opinion needs some work. It’s a signature, and he needs to juice this one up. James was moved around on the Texans offense. As a logger jam emerged at Tight End with Owen Daniels, Joel Dreessen, and newcomer Garrett Graham, the Texans liked what they had with Casey’s exceptional hands and straight on blocking. When Vontae Leach left for Baltimore to block for Ray Rice in 2011, the team made the decision to shift Casey to fullback. Casey provided immediate mismatches for teams that looked absolutely baffled when he shifted out of the backfield and out to the flat. He’d rip defenses with 18 receptions for 260 yards a 14.4 yard average including his first professional touchdown this last season in 2011, but he’d also rip his pectoral muscle against the Saints sidelining him for a good portion of the season. In 2012, the team seems content utilizing him as an H-Back, as he creates many mismatches with his deceptive speed combined with his linebacker size. 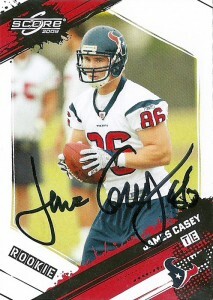 We didn’t see him much during the preseason, and the Texans with a full docket of weapons and a true fullback blocking up front, are keeping hush hush about how they will sneak Casey into the lineup later in the season for 2012.